Forget the Galaxy S4, the next big thing in tech is… home appliances. That's according to Samsung President BK Yoon who spoke at the Samsung EU Forum in Monaco today. Samsung already owns the living room, claimed Yoon. "Three Samsung TVs are sold every second," he said. "And in 2012 we made $184bn in sales. We invest $9bn every year in R&D to develop the next big products." 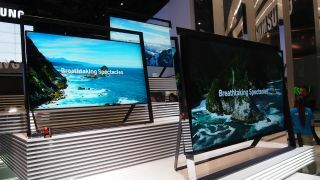 For reasons that are unlikely to become clear anytime soon, TechRadar found itself at Samsung's home appliances press conference in Monte Carlo, where the Korean company launched products including the new eco bubble washing machine, a new fridge and a robotic vacuum cleaner. The Samsung press conference, which involved some bizarre role playing from American actors, was designed to illustrate Samsung's belief that high tech is expanding from consumer electronics into the home appliances business. "We think innovation is truly the key to our company's success," said Yoon. "That's how we are able to bring the world's first, best and amazing products to the market. We believe that the next big thing is home appliances. Why? Because the home is the most important place for all of us, in each country, in each culture. "We want to make your home more pleasant and more enjoyable. We must understand the need of consumers around the globe." TechRadar's inexplicable presence at the event – which awarded each attendee a patchwork knot bookmark – was made worthwhile with the unveiling of Samsung's new "grab and go" plastic basket which comes part and parcel with its new fridge. That's a condiments tray to you and me, and worth every penny of the R&D invested in it.